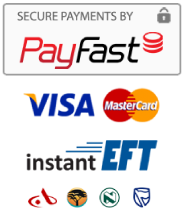 We accept the following major credit cards via our online services: Visa, MasterCard. We also accept EFT. Please contact us for current rates and Transit times. What are the transit times for orders shipping via Courier? Orders shipping to Cape town : 2-3 business days. Orders shipping to Durban: 1-2 business days. Orders shipping to Johannesburg and surrounds : Next day or 1-2 business days for surrounding areas. Orders shipping to Port Elizabeth: 2-3 business days. Orders shipping to East London: 1-2 business days. Express Shipping : Express Shipping nationwide is Next Day delivery provided we recieve the order and payment by 1pm. NOTE: The above courier transit times are approximate and delivery dates cannot be guaranteed. Please note that all orders are shipped within South Africa via Fastway couriers, The Courier Guy, Postnet and Ram hand to hand couriers. All returns will be refunded in 3-5 working days based on the above criteria being met.